I’m perfecting the art of the sugar high. Whatever you do, don’t eat this fudge with a cafe cubano. I don’t even want to know what would happen if you did. It might get ugly. Actually….try it!! I double dog dare you. This is another one of the recipes from my great grandmother’s recipe box. I’m having a blast baking my way through them! It’s totally easy and I wish I would have made this a month ago because, guess what? Fudge makes great gifts! Even if people don’t SAY they like fudge, they do. It’s all about those late-night creepy crawly missions to the fridge for a cold, chewy bite. Don’t act like you’ve never been there! 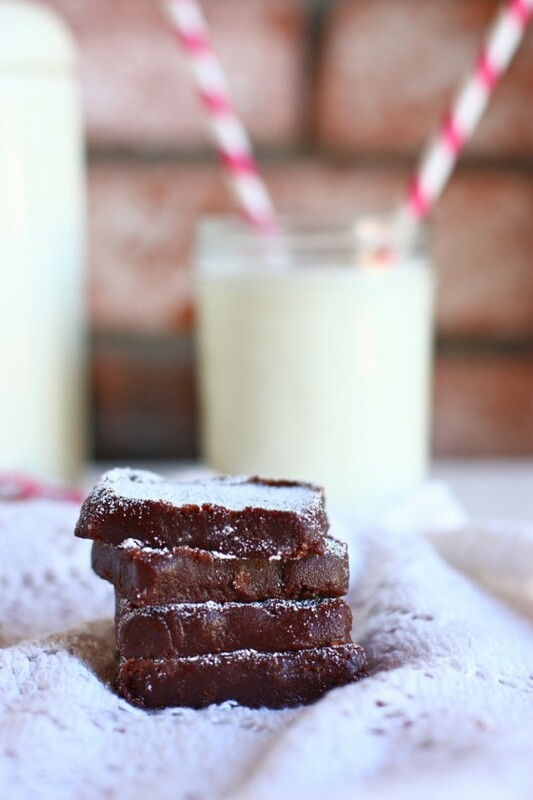 Fudge is also great for heartache, homesickness, jetlag, road trips, Tuesdays, mid-afternoon slumps, mid-morning slumps, cute neighbors….did I mention Tuesdays? So here’s the deal. 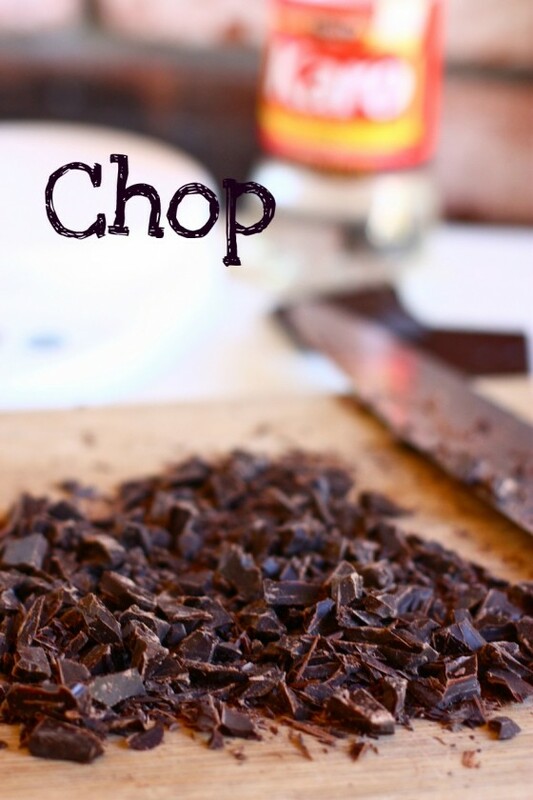 All you do is chop the chocolate—unsweetened! Then you stir the chocolate on the stove with butter, shortening, milk, sugar, corn syrup, salt and vanilla. It doesn’t seem like it should work but it does! Oh, does it ever. Finally, you pour it into a buttered dish. Then you wait. Or you burn your tongue. I vote for tongue burning! See how easy? Now you try! Let me know how it goes—this recipe is nice because it doesn’t make a truckload…only about 18-20 pieces depending on how your slice the fudge. And fudge in the freezer? Is there anything in life better than FUDGE IN THE FREEZER??? I think not. Oh!! You can also add peanut butter to this recipe for peanut butter chocolate fudge. Do it. Combine all ingredients (plus peanut butter if you like) except vanilla in a saucepot. Stir well to combine and bring to a boil, stirring constantly. Stir constantly while boiling for one minute then take off heat and add in vanilla extract. 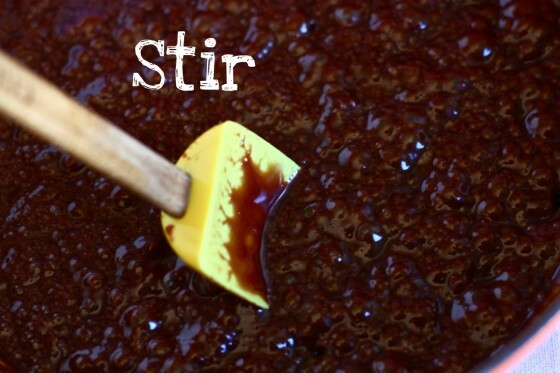 Stir fudge until thick, about five minutes. Then, pour into a buttered or parchment paper-lined casserole dish. Let cool for two hours in fridge before slicing. Fudge is one of my favourite things in the world but it always seems so very complicated, I love this version and it looks so lovely and chewy! There is absolutely nothing better than chocolate in the freezer. I can say this because every night after dinner I reach into my chocolate stash and take out a few pieces to enjoy! 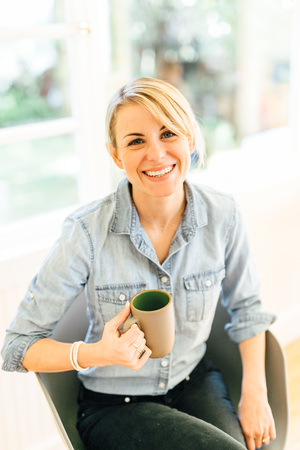 Jenna – how late are you up?! ohhhh gotcha 🙂 i’m in cali and i work nightshift…i was like why on EARTH is she always posting so late?! MINUTE?! Don’t do this to me!? Mmm this looks so chewy and yummy! Did you great grandmother win a lifetime supply of shortening? It must have been the thing way back when…. Also, noted your dog picture on Twitter. I’d love to see more beagle action!! YUM, I love fudge.. makes me think of my aunt when I was growing up -she had the best recipe. How did you get the cute writing on your photos, btw? it’s a website called Picnik—check it out! You can do fonts, photo editing and collages for free! what size cassarole dish did you use? Sorry—an eight inch square pan. I feel like shortening is such a classic sign of a vintage recipe! Curious though, do you ever use shortening in recipes that you create? The only recipe I use shortening in that is my own, is my pie crust! I’m more of a pure butter girl. Holy smokes. That first picture makes fudge look better than it’s ever looked before. Thank you and your great grandmother for inspiring me to go make this as soon as I have some time to get into the kitchen! I just made Bakerella’s Biscoff Fudge and it was divine! Think I’ll be trying this next! Wow! Those looks so freaking good! This looks pretty easy and could definitely be fun to give out as a gift… or bring to a party… or to just eat it at home. I’ll probably go with option #3. Oh this looks delicious! I had no idea that fudge was so easy to make! Easy peasy! Never heard of this kind of fudge before, but holy moly does it look good! I’ve seen so much fudge lately! It’s giving me a serious craving. Is it weird that I still have Halloween candy in the freezer?? Ok, I will try this. Even though when you say “easy” I immediately hear “there’s some way I will screw this up” 🙂 I mean, if successful, I will have to run 10 miles a day to work it all off but I’m sure it’ll be worth it. This is way too easy. That equals dangerous in my dictionary. It looks so rich and decadent…and easy! I love easy fudge recipes and recipes that do not use candy thermometers are a definite win. I picked up some Cafe Bustelo last night at the grocery store in honor of you! I am going to brew it up later today! I always thought I didn’t like fudge, but I’m beginning to think I don’t like marshmallow fluff based fudge. Which makes sense since I don’t like marshmalllows. 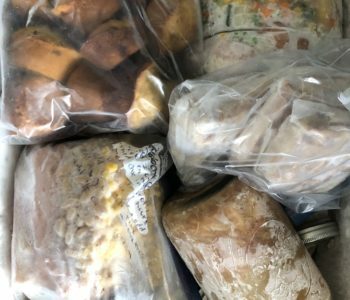 In the middle of December I bought all the fixin’s for fudge but never made it. I literally woke up this morning wondering if I had missed the appropriate fudge making window, and I had decided to wait until Valentine’s Day to make it, but you’ve confirmed for me that, in fact, it is always a good time of the year for fudge! Yum– love the idea of making this with peanut butter! You just had to suggest adding peanut butter…I’m sold! People that don’t like fudge!? Huh! They are missing out. 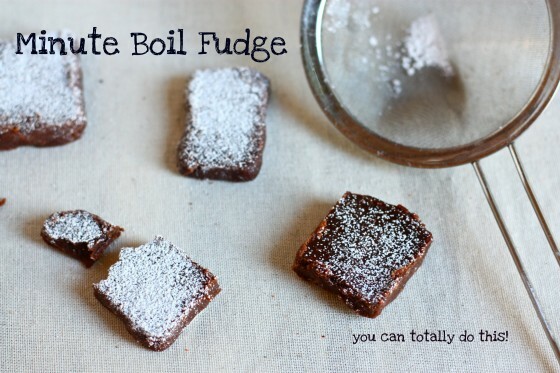 Love this recipe and that first picture…I feel like just looking at it I can taste the dense gooey fudge. 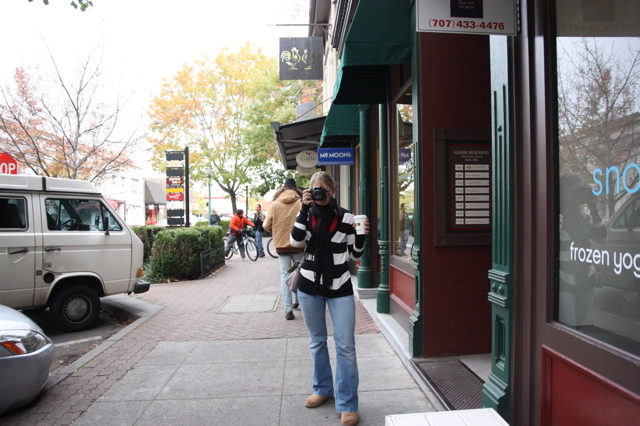 LOVE your pictures!!! and the treat looks pretty tasty too! How essential is the shortening? It’s quite hard to get here. Could you just use extra butter? Ditto– no Crisco in the pantry. Can I use twice the butter? You can try! I haven’t done that myself so I can’t guarantee it, but I’m sure it would work fine. I totally vote for eating the fudge with the espresso! I am a teacher and my colleagues and I often have chocolate and espresso day with each of us alternating as barista on the coffee maker on days we do not have students. Thank you for sharing your vintage recipe! Grandmothers know best. I never make fudge because it is so time consuming. I love this recipe. I am totally making peanut butter fudge this weekend for my husbands birthday when my in-laws come over. Thanks so much for the recipe. I’ve never made fudge before but this recipe plus some peanut butter sounds amazing! This looks really good. When I was in high school, I made fudge using condensed milk, chocolate chips, and vanilla – all on the stovetop. It was gooey and sweet and amazing.. I love that it’s so easy and that it came from your grandmother’s recipe box. Throw into a bowl, microwave for 2 or 3 mins total (stirring every 45 sec or so to avoid burning chocolate) and pour into a greased 8×8 pan. Add nuts, chocolate chips, whatever you like for chunks. Easy! this is a recipe from the recipe “way back machine”. Gramms made this exact recipe with the ception of pnutbutter. Christmas time fudge fav. 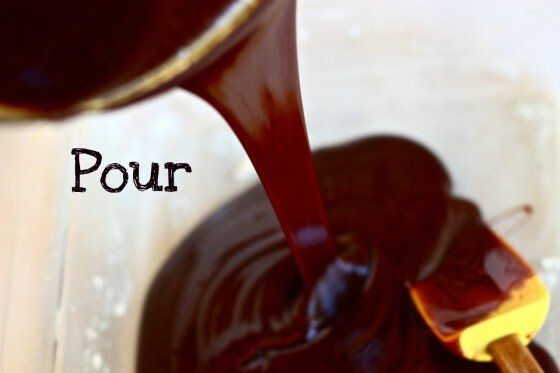 I’ve made this recipe twice since you posted it and we LOVED it both times, despite the fact that the first time I substituted 6 tablespoons of cocoa and 2 tablespoons of oil (next time I’d use butter) for the unsweetened chocolate and the SECOND time I subbed 100g (3.5 oz.) semi-sweet chocolate bar for the unsweetened and reduced the sugar a little. That time the fuge was a little crumbly but sooooo good. Thanks (from me, my husband and our 4 kids) for the perfect recipe for a simple and quick Sunday afternoon fudge! !